The DRI-LPI Series are DIN rail mount, loop-powered isolators with single (DRI-LPI-MA), dual (DRI-LPI-2MA) or quad (4) channel (DRI-LPI-4MA) capability. Each channel accepts a 0 to 20 mA or 4 to 20 mA input and outputs a proportional 0 to 20 mA or 4 to 20 mA signal. The DRI LPI Series provides 1800 Vdc signal isolation from input to output and channel to channel. All DRI-LPI Series modules feature plug-in screw terminals for easy installation and low Mean-Time- To-Repair (MTTR). Two or more modules can slide together and interlock for solid, high density mounting. This is accomplished by removing either the foot or the adjacent unit’s faceplate (for right-hand side or lefthand side mounting, respectively). The module to be attached will easily slide on to the side of the mounted unit. Loop-powered isolators are used to isolate process signals transmitted between field instrumentation, programmable logic controllers (PLC), distributed control systems (DCS) and data acquisition systems (DAS). 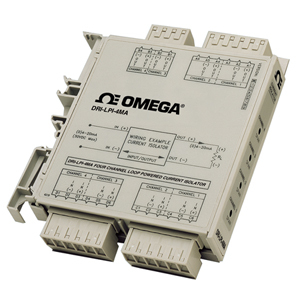 Outputs from these systems can also drive one or more isolator channels of the DRI-LPI Series. Field devices such as flow, level or temperature transmitters can also drive a DRI-LPI Series isolator channel. The 1800 Vdc isolation capability prevents ground loops from causing errors in 4 to 20 mA current signals and can reduce susceptibility to radio frequency interference (RFI). Isolation also provides protection from high voltages and current spikes which can damage expensive supervisory control and data acquisition (SCADA) equipment, such as a PLC or DCS. The DRI-LPI Series operates as a loop-powered isolator, with each channel deriving its power from the input loop current, 0 to 20 mA or 4 to 20 mA. The effective load of a DRI-LPI Series isolator channel on a loop is 300 Ω plus the output load resistance. For example, if the load on an output of the DRI-LPI Series is 500 Ω, then the current loop connected to the input would need to drive 300 Ω plus 500 Ω (i.e. 800 Ω) at a maximum current of 20 mA, or 800 Ω x 20 mA which equals 16.0V. The DRI-LPI Series is protected from reverse input polarity and output short circuit. A span pot is provided for each channel in order to calibrate the output to the load. What Other People Bought: When you see this icon, click on it to expand a list of products that other people have bought when they purchased this model.